Intense laser flashes remove the electrical resistance of a crystal layer of the alkali fulleride K3C60, a football-like molecule containing 60 carbon atoms. This is observed at temperatures at least as high as minus 170 degrees Celsius. Superconductors have long been confined to niche applications, due to the fact that the highest temperature at which even the best of these materials becomes resistance-free is minus 70 degrees Celsius. Nowadays they are mainly used in magnets for nuclear magnetic resonance tomographs, fusion devices and particle accelerators. 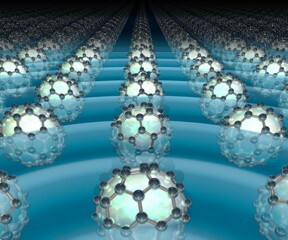 Physicists from the Max Planck Institute for the Structure and Dynamics of Matter at the Center for Free-Electron Laser Science (CFEL) in Hamburg shone laser pulses at a material made up from potassium atoms and carbon atoms arranged in bucky ball structures. For a small fraction of a second, they found it to become superconducting at more than 100 degrees Kelvin - around minus 170 degrees Celsius. A similar effect was already discovered in 2013 by scientists of the same group in a different material, a ceramic oxide belonging to the family of so-called "cuprates". As fullerenes have a relatively simple chemical structure, the researchers hope to be able to gain a better understanding of the phenomenon of light-induced superconductivity at high temperatures through their new experiments. Such insights could help in the development of a material which conducts electricity at room temperature without losses, and without optical excitation. All hopes for superconductivity at room temperature have been riding on ceramic materials known as cuprates. These materials lose their electrical resistance at relatively high temperatures, which can be as high as minus 120 degrees Celsius. For this reason, physicists refer to these materials as high-temperature superconductors. Andrea Cavalleri, Director at the Max Planck Institute for the Structure and Dynamics of Matter, and his colleagues aim at paving the way for the development of materials that lose their electrical resistance at room temperature. Their observation that fullerenes, when excited with laser pulses, can become superconductive at minus 170 degrees Celsius, takes them a step closer to achieving this goal. This discovery could contribute to establishing a more comprehensive understanding of light-induced superconductivity, because it is easier to formulate a theoretical explanation for fullerenes than for cuprates. A complete explanation of this effect could, in turn, help the scientists to gain a better understanding of the phenomenon of high-temperature superconductivity and provide a recipe for an artificial superconductor that conducts electricity without resistance losses at room temperature. In 2013, researchers from Cavalleri's group demostrated that under certain conditions it may be possible for a material to conduct electricity at room temperature without resistance loss. A ceramic oxide belonging to the family of cuprates was shown to become superconductive without any cooling for a few trillionths of a second when the scientists excited it using an infrared laser pulse. One year later, the Hamburg-based scientists presented a possible explanation for this effect. They observed that, following excitation with the flash of light, the atoms in the crystal lattice change position. This shift in position persists as does the superconducting state of the material. Broadly speaking, the light-induced change in the structure clears the way for the electrons so that they can move through the ceramic without losses. However, the explanation is very dependent on the highly specific crystalline structure of cuprates. As the process was understood at the time, it could have involved a phenomenon that only arises in this kind of materials. The team headed by Cavalleri therefore asked themselves whether light could also break the electrical resistance of more traditional superconductors, the physics of which is better understood. The researchers from the Max Planck Institute for the Structure and Dynamics of Matter, among which Daniele Nicoletti and Matteo Mitrano, have now hit the jackpot using a substance that is very different to cuprates: the fulleride K3C60, a metal composed of so-called Buckminster fullerenes. These hollow molecules consist of 60 carbon atoms which bond in the shape of a football: a sphere comprising pentagons and hexagons. With the help of intercalated positively charged potassium ions, which work like a kind of cement, the negatively charged fullerenes stick to each other to form a solid. This so-called alkali fulleride is a metal which becomes superconductive below a critical temperature of around minus 250 degrees Celsius. The researchers then irradiated the alkali fulleride with infrared light pulses of just a few billionths of a microsecond and repeated their experiment for a range of temperatures between the critical temperature and room temperature. They set the frequency of the light source so that it excited the fullerenes to produce vibrations. This causes the carbon atoms to oscillate in such a way that the pentagons in the football expand and contract. It was hoped that this change in the structure could generate transient superconductivity at high temperatures in a similar way to the process in cuprates. To test this, the scientists irradiated the sample with a second light pulse at the same time as the infrared pulse, albeit at a frequency in the terahertz range. The strength at which this pulse is reflected indicates the conductivity of the material to the researchers, meaning how easily electrons move through the alkali fulleride. The result here was an extremely high conductivity. "We are pretty confident that we have induced superconductivity at temperatures at least as high as minus 170 degrees Celsius," says Daniele Nicoletti. This means that the experiment in Hamburg presents one of the highest ever-observed critical temperatures outside of the material class of cuprates. "We are now planning to carry out other experiments which should enable us to reach a more detailed understanding of the processes at work here," says Nicoletti. What they would like to do next is analyze the crystal structure during excitation with the infrared light. As was previously the case with the cuprate, this should help to explain the phenomenon. The researchers would then like to irradiate the material with light pulses that last much longer. "Although this is technically very complicated, it could extend the lifetime of superconductivity, making it potentially relevant for applications," concludes Nicoletti.